E-Pen&Form allows you to use handwriting-on-paper in ways you never imagined. 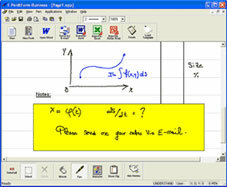 As you write, the information is directly and easily placed on customized forms in your computer. 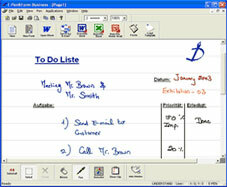 No more tedious data entry from handwritten forms! This innovative technology merges the old with the new to create an amazing direct-to-digital link that can be used in a wide variety of everyday tasks. Converting pen-and-paper notes so you can use, store, edit and manipulate them with your computer won’t be a problem anymore. With E-Pen&Form, you can place your handwritten notes into any format desired—telephone message pad, fax, meeting minutes, etc.—all on your computer! As you write your notes with a special digital pen, E-Pen&Form transfers them into your customized page layouts using our technology. Your handwritten notes are reproduced within the context of your chosen formats, such as order forms, company letterheads, daily organizers, notepads etc. This customization is performed automatically. Adding to your notes is easy—E-Pen&Form transfers your notes in the same order as they appear on your paper, so if you add a word later, E-Pen&Form recognizes the position of the new item and inserts it into the correct location in your document. E-Pen&Form provides customization options for company forms, stationery and graphic formats you already have—less redesigning needed to conform to a computer program's requirements. With E-Pen& Form, your sales representatives can write orders and other customer data directly onto your personalized application forms and send the information directly to your computer. Fast and efficient! E-Pen&Form means that your customers can place information directly on your specialized data sheets and e-mail the information to you. No downtime transferring handwritten orders to an e-mail form! Even if your hotel and travel reservations are handwritten, you can use E-Pen&Form to access your plans and schedules wherever you are on your PDA or laptop computer. Choose the ink color and line widths that are right for you. 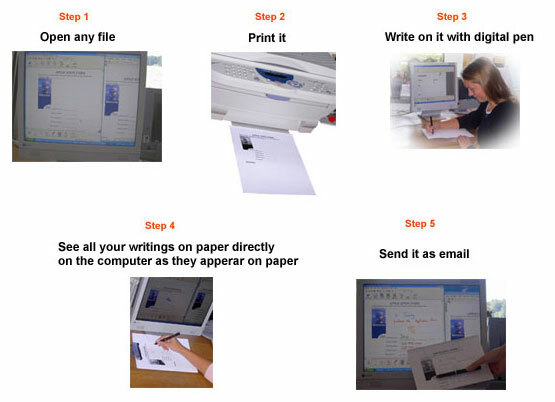 Send your handwritten text by E-mail. Customer order forms—even through e-mail!